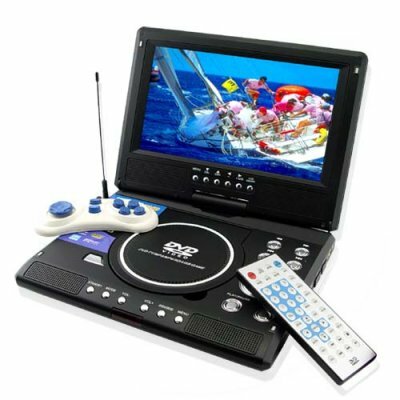 Successfully Added Portable DVD Player with 9 Inch LCD Screen + TV to your Shopping Cart. Portable DVD with TV and 9 inch LCD swivel screen in a well designed black body casing. Playing most disc formats (including dvdr and cdr playback), an analog TV tuner, USB and SD card viewing, and a versatile LCD flat screen means only one thing - you are sure to easily keep yourself entertained wherever you are! If you ever get tired of watching DVDs, videos and TV shows then get gaming with the 8bit NES emulator and gamepad or use it to listen to MP3's or view your digital photo collection. Buy a personal sample today at Chinavasion's low wholesale prices and then move on to bulk orders to sell for mega profits on your EBay, Ubid, or Amazon internet shop. Plays all major disc formats as well as reads digital media files from its USB and SD card slots. on 2009-04-28 23:15:43 100% satisfied with this portable DVD player. on 2009-02-22 23:20:37 Excelente produto!